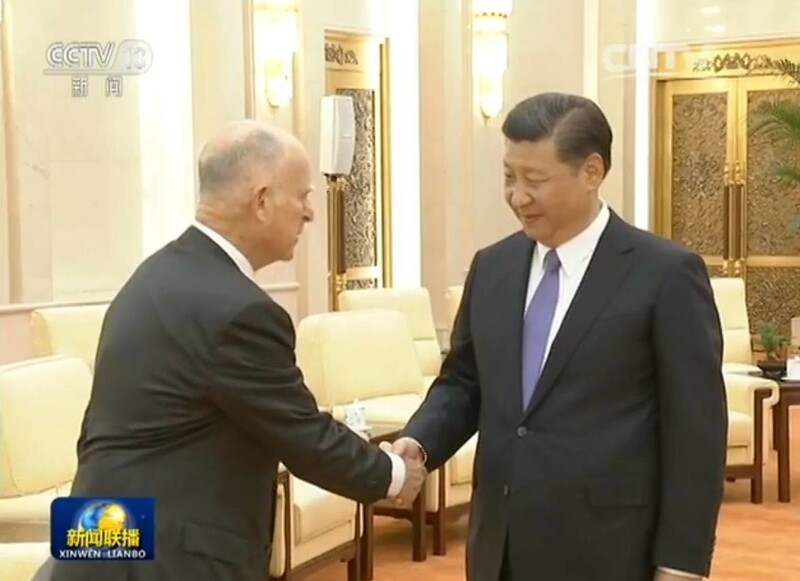 International news outlets presented U.S. California governor Jerry Brown’s recent trip to China as a major event. For many, the visit was a clear acknowledgement that Beijing was taking command of the climate change agenda and committing itself to global leadership on the environment as well as major investments in energy savings industries. Then why doesn't China's State-controlled media agree? 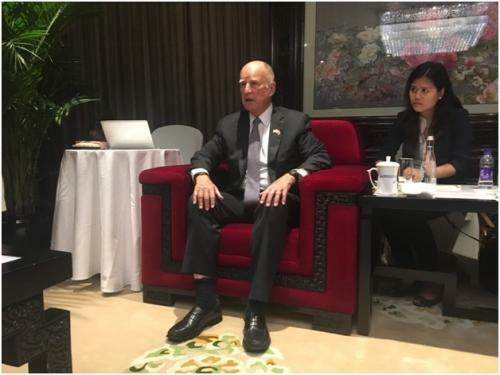 One reason is that Brown’s trip isn’t really big news here, particularly in Jiangsu where he’s visited and signed agreements in 2013 and 2015, and with whom California already enjoys a strong relationship. Nanjing Daily [南京日报] didn’t bother to cover the visit for their daily subscribers; local newspapers largely consigned Brown's stopover to the inside pages if that; and even social media had very little to say on the subject. That’s partially because Jiangsu has been engaged in its own environmental campaign for well over a decade. Officials here aren’t all that interested in passing along what works in Jiangsu to other nations because they know from experience that there are major differences across counties, never mind countries. Decision-makers have enough of a challenge seeing local projects to completion so they’re not going to spend too much time discussing matters with visiting dignitaries, nor announce new policy. There wasn’t news to report (save Brown’s ongoing interest in high-speed rail) because it’s not new, and not all that significant. Central news agencies here did broadcast Brown’s meeting with Chinese president Xi Jinping, but that's because coverage of Xi dominates the news—not because an American governor stopped by to congratulate China on its supposed success. And Xi’s focus was on US-China cooperation generally; when Xi spoke of California’s contribution, he noted science and technology as well as innovation [创新], but barely nodded at the issue of “green development” [绿色发展]. If Xi’s emphasis was on leading the fight against climate change and for green energies, Brown’s visit was a perfect opportunity to make that plain. But Xi didn’t do that. Xi clearly has other matters on his mind, at home and abroad, and the news coverage here in China reflects that his focus is currently elsewhere. There’s another reason why State media coverage didn’t extoll Brown’s efforts: Beijing wants to make sure that it, not the provinces, directs China’s environmental policies. There’s always been tension between central and local governments in China over environmental matters, with lower-level officials here often eager to make progress and conclude agreements with representatives of foreign governments and companies, without having to wait for Beijing to sign off. Many local officials also want more autonomy to deal with disputes and protests related to environmental matters, and dislike and resist recent efforts by Beijing to intervene and supervise green policy generally. This pulling and hauling between agencies and levels of government in China means that Beijing doesn’t have a single environmental policy or a climate change strategy; it has a multitude of them. The Xi leadership has been trying to transform that situation, pushing to centralize decision-making, give less authority to local governments, and put its people in places where loyalty to Beijing has been questionable. Xi and his people want to be in charge, and many haven't been happy with provinces pushing their particular agenda at the expense of the central government. Whether that’s a smart move or a misguided one by Beijing is open to question, since sometimes China’s local officials help to protect the environment while at other moments and places, economic development and political promotion takes priority for them and they couldn't care less about their constituents. What is clear is that, under Xi, Beijing wants to dictate how provinces and cities handle green development, and not allow localities to make their own policies without central imprimatur. So that’s another reason why media coverage of Brown’s visits to locales was constrained: It reflects the current political line that environmental policy is what Beijing is supposed to be in charge of, not local governments. Why hype a visit that reflects a reality that Xi is trying to have changed? Speaking well of Brown's visit would encourage this sort of soft separatism, and so Chinese media was clearly told by Beijing to stay quiet. There’s a larger lesson here—or at least there really should be: That assuming that China is doing something that the United States isn’t—or doing something far better—is dumb. Indeed, that recent assessment that Beijing is leading the way in green energy and Washington is falling behind—a claim that China’s local officials scoff at--is precisely the same argument made by the same people early in the decade. That conclusion was wrong then, and it’s still wrong. The reason everyone should know that is because China’s own media tells us so. Press coverage in the Los Angeles Times was bizarrely breathless, and, in the case of the headline stating that “Chinese climate officials let loose on President Trump as Jerry Brown concludes visit,” guilty of hyperventilating. There’s only one Chinese official cited as criticizing Trump and he’s retired—so he’s not only not “officials”; he’s also not “official” any longer. The so-called large amount of attention in China devoted to Brown’s visit claimed in the Los Angeles Times by a “Special Correspondent” (a title which may mean the reporter is not accredited) apparently refers to the English-language media here in China--not the actual Chinese media, which is what residents here rely on for information and policymakers for the current political line. The former is presented as policy to foreigners who don’t or cannot read Chinese newspapers and other media; but it’s simply propaganda, designed to deceive. Foreign reporting that relies on those sources is suspect at best. Many thanks, Matt. Much appreciated, especially given your very fine reporting here and now from California. You're correct of course: Sichuan media did seem to highlight Brown's visit there in ways that the Jiangsu media here decided not to. Li's statement here seems to have captured the theme of the encounter and what officials here believed to be important: "江苏与加州两省州结好以来，经过32年的友好交往，双方正迎来交流合作的最好时期。江苏制造业发展基础扎实，科教人才资源丰富，创新创业活力强。加州经济发达，是美国高新技术研发和产业化最主要的发动机." Pitched at a general level, with the odd nod to climate and energy cooperation pretty much mimics what Xi said to Brown in Beijing.